Hi! 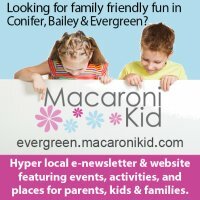 I am Julie and I am the publishing Mom of Evergreen, Bailey, and Conifer Macaroni Kid. I grew up in Evergreen, so my passion for this beautiful mountain community runs deep. What is Macaroni Kid? It is a place for you to find all kinds of events and family friendly activities to keep you and yours entertained in our beautiful mountain community. Each week you will be updated with a newsletter dedicated to all things family fun in our community and a calendar loaded with current events to keep you busy all throughout the year. If you know of an event that isn't listed, please let me know! Here is to many family fun adventures!